In many parts of the country peanuts cannot be grown as they need a long hot season. Peanuts take 130 days to maturity although there is an ‘Early Spanish’ variety that matures in only 100 days. During that time, temperatures shouldn’t fall below 55 degrees. If you have a greenhouse however, you’re in luck. They will be very happy in a deep tub and you’ll have great fun watching them grow. Peanuts do not grow on trees like many people expect because they aren’t nuts – they’re legumes. The plant itself is unusual and quite beautiful. 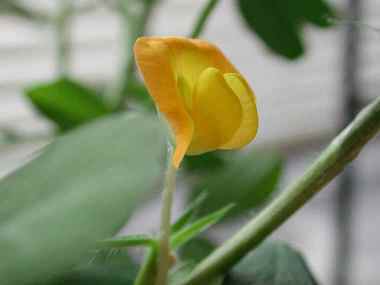 Small yellow blossoms appear on the plant, then wither and small “pegs” forms in their place. The pegs dip down into the soil and begin to form peanuts. Begin by shelling raw peanuts. Be sure they’re raw or you’ll be waiting a long time. It’s also important that each individual peanut stays whole. If one splits, it won’t grow. Place them approximately one to two inches beneath the soil being certain they don’t touch. In a container 6-8 inches in diameter you can plant five or six peanuts. Water them then cover the container with a transparent film. In about a week they will break through the soil. Remove the film and continue to keep the soil moist but don’t overdo it. When they reach 3-4 inches, carefully remove each plant and transplant each into it’s own container. Make certain the container is large enough for the little peanuts to grow under the soil when they are ready. Place the containers in a sunny spot and rotate them frequently so they grow straight. The flowers will bloom during the day and close at night. As soon as the flowers fall off, you will know that a peanut is beginning. Watch as the tiny peanut peg dips beneath the soil. It can be fun to grow one or two of the plants in a clear container and watch the peanuts form under the soil. If you have a time-lapse camera this would make a terrific show-and-tell project for a school child. After you harvest your peanuts allow them to dry for two to four weeks. Then simply store them in a cool, dry place until you’re ready to roast them. And save enough for show-and-tell! *Remember, some children may be allergic. Bought to boil She loves hot boilwd peanuts. As I was washing them to put in the pot to cook I seen some of them had started to sprout and grow So I put a small amount up until this springs garden I was so glad to see them start to come up. The plant have only been in the grown for about a mounth. and they are now flowering. but the plants are still every small just under a foot tall. is that the right size. I keep them well watered. how long do I need to leve the peanut peg beneath the soil. be for I dig them up And how will i know when it’s time to harvest the peanuts. I live east of Dallas,tx and purchased a bag of raw peanuts from the store. They were crackd and planted in April with the husks on about one inch deep in sandy loam soil. After about three weeks about half of them came up. I thought maybe the soil was too cold. I then shucked somemore and put them in water for about a week before planting. They swelled by about half,but never sprouted and fearing they might rot planted them. After about 4 days they came up. They are about half the size of the first plants which are now flowering. Can peanuts be grown in hotter, drier climates? I would like to try my hand at them as well but am unsure if it will just end up being a big waste of time and money.